A file photo of a ballot. Most congressional and gubernatorial races for the 2018 midterm elections have been called, but a few elections are still awaiting decisions. In two toss-up Senate elections, Republicans have narrow leads. Republicans also have narrow leads in some gubernatorial races. Democrats are leading in half of the House races that have not yet been called. A GOP favored Senate race in Mississippi between incumbent Republican Sen. Cindy Hyde-Smith and Democrat Michael Epsy, a former U.S. secretary of agriculture, resulted in a run-off because neither candidate garnered 50 percent of the vote, NBC News reported. Hyde-Smith notched 41.5 percent of the vote and Espy 40.6 percent, with 99 percent of precincts reporting. Another Republican, Chris McDaniel, had 16.5 percent. The special election was held to fill a seat by retired Sen. Thad Cochran. Hyde-Smith and Epsy next compete in a runoff on Tuesday, Nov. 27, NBC News reported. In the U.S. Senate race to represent Arizona, Republican Rep. Martha McSally has a 0.9 percentage point lead over Democratic Rep. Kyrsten Sinema, the pair separated by nearly 16,000 votes with 75 percent of results in. McSally, a former combat pilot, competed against Sinema, a former Green party activist who campaigned as a pragmatist for the seat held by outgoing GOP Sen. Jeff Flake. Whoever wins will become Arizona's first female senator. It could take days before the victor is determined, the Arizona Republic reported. "There are a lot of outstanding ballots – especially those mailed-in – and a lot of reasons to feel good!" Sinema tweeted Wednesday. 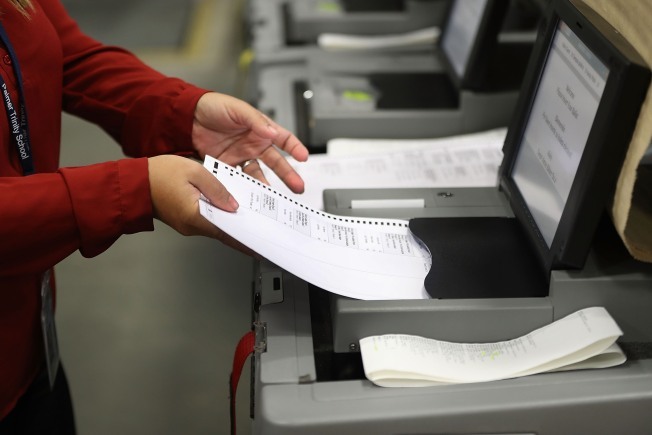 The Maricopa County recorder’s office had 472,000 ballots left to count, according to KPNX reporter Brahm Resnik. In the Florida race for U.S. Senate, Republican Gov. Rick Scott has a .4 percentage point lead over three-term Democrat incumbent Sen. Bill Nelson, with 99 percent of the vote in. State law requires a recount when candidates are within one-half a point of each other. Nelson’s chief of staff said that the candidate has no intentions to concede the race, a move that Scott's campaign slammed after having declared victory. “This race is over. It’s a sad way for Bill Nelson to end his career," spokesman Chris Hartline told NBC. "He is desperately trying to hold on to something that no longer exists." Florida officials will not order a recount until the first set of official returns are due on Saturday, The Associated Press reported. Will Stacey Abrams Force a Runoff in Georgia? Georgia’s much-watched election for governor between Republican two-term Secretary of State Brian Kemp and Democrat Stacey Abrams, a lawyer, former state legislative leader and romance novelist, is also still too close to call. Kemp has a 1.7 percentage point lead with 99 percent of the votes in for the race, for a lead of 66,316 votes. Kemp said that even with absentee, mail-in and provisional ballots left to count the "math is on our side." Abrams' campaign countered that there are at least 87,000 early votes and mail-in ballots left to count that could help them trigger a runoff, The Associated Press reported. Abrams campaign estimates it needs to notch nearly 25,000 votes to do so. She would become the nation's first black female governor, if elected. There are also 14 House races that still have no apparent winner, six of them in California. Democrats currently lead in seven races: three in California and one each in Maine, Washington, Georgia and Utah. Republican candidates lead in seven: three in California and one each in Georgia, Minnesota, North Carolina and New Jersey. Among the candidates still fighting to stay ahead of their opponents is Democrat Gil Cisneros for California’s 2nd District. Cisneros is a former Navy veteran and lottery winner. Republican incumbent Rep. Dana Rohrabacher in California’s 48th District is also struggling to get ahead of his challenger. Rohrabacher has cast himself as a maverick, but his Russia-friendly behavior became a weapon for the Democrats trying defeat him. —Daniel Macht and The Associated Press contributed to this report.